Buying insurance is not like buying bread or milk. Insurance is an important safety net for your family, home, car or business. There is a difference in where you buy your protection. Is not beholden to any one company; thus, policyholders do not need to change agencies as your insurance and service needs change. Is a consumer's consultant working to determine the consumer's needs. Is a value hunter who looks after the consumer's pocketbook in finding the best combination of price, coverage and service. Can periodically review a policyholder's coverage to keep up with changing insurance needs. 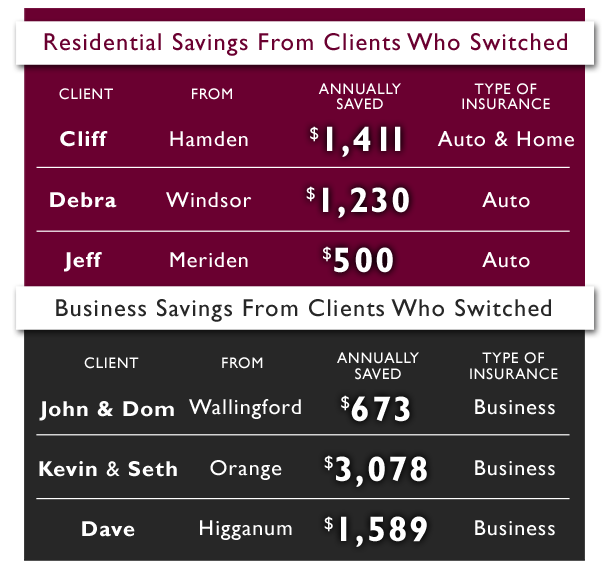 We Bring Real Savings to Real People. Don't just take our word for it, take a look at the numbers. Independent Insurance Agents - Represent an average of eight insurance companies and research with these firms to find consumers the best combination of price, coverage and service. Telephone Representatives - Offer consumers the insurance of one company via the telephone. Internet Sites - Consumers fill out an application online and receive an insurance quote without any help or direction from a qualified professional.